2draw.net - boards - Intermediate - Rawr. [mazi]: I will, then. Since I really think the pic could use it....it's just so plain. >_< As far as muscle definition....you mean something like this? know what would rock? if you got really into the anatomy of pics like that.. with all the muscles and stuff. and i vote more contrast because im picky >_> but youre getting awesome. Here ye be, Mazi. Better? I think so. Doood, muscles. Shading got awesome, and I like his teeth. 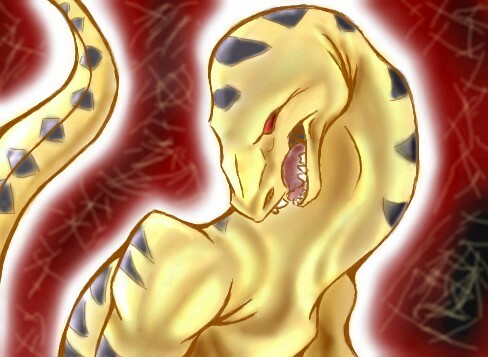 *pets with a long stick* To be really picky, the color in his markings sorta bleeds into the yellow of the skin... not that much, though. Kickassness. I want one. Awsome, Just awsome. Thats Fantastic shading. Gourges. Great job. yeas, very awesome!!! it's so cool!!! the colourz and lineart, anatomy, all so goooddd!!! which tool did you use for the lineart? ^^ Watercolor for color, if you care. wouldnt want to meet a wild one. Nice color and lighting! It adds a strange texture to him. Don't know how I missed seeing this one before.. he looks electric! Really cool. whats he looking at? whats he doing with his arms?